Nikon D7200 Body. 1 Original Nikon Battery. 2 SD Cards. NEW IN BOX. Not refurbished. 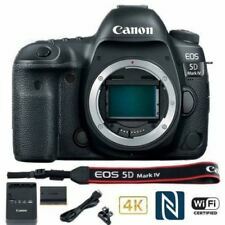 Canon 1 year warranty included. Lens 18-55mm. Body exhibits only minor signs of wear. Photos are of the actual item and have not been altered. and a neck strap. Trending at C $213.22eBay determines this price through a machine-learned model of the product's sale prices within the last 90 days. Fujifilm X Series X-T1 16.3MP Digital SLR Camera - Black (Body Only) and EXTRAS. Condition is Used. Shipped with USPS Priority Mail. Was used as a travel camera for a few trips per year. Installed a temper glass screen protector for the display on the first day. Extras include: -Lowepro Camera Bag -Peak Design Camera Strap with connectors -Temper Glass Screen Protector (original box included) -Extra Battery Camera Box includes are original accessories (flash, battery, camera strap, charger). Camera is in perfect working condition and has been factory reset. Ready for immediate use. This is only for the camera body. Buyer will need to buy their own lense(s). For sale, no reserve. LCD screen has a few hairline streak mark that are barely noticeable. The EF-S 18-55mm f/3.5-5.6 III is a standard zoom lens perfect for those wanting to start exploring DSLR photography. Good for most shooting situations. Maximum Magnification 0.12x (18mm) -- 0.34x (55mm). 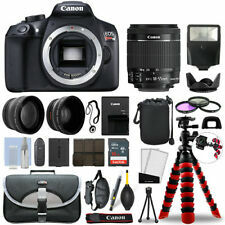 Great condition Canon 7D DSLR. An online shutter count test showed less than 4000 shots taken. Canon T3 with 18-55mm lens. Owner's manual. Everything is tested and is in perfect working order. That's our promise to you. 100% functional. This warranty does not cover intentional or accidental abuse or neglect. This is Nikon D610 24.3mp. Nikon D610. Those three pictures were test shots to get a shutter count total. Shutter Count 62. Canon EF 35 - 80mm lens. (Canon Lenses). Check out the pics to judge the condition for yourself. Free local pickup in Denver/Boulder, Colorado. United States. Sony Alpha a6000 24.3MP Digital SLR Camera - Black with 2 Lenses. Condition is Used but in good condition The 2 lenses are 3.5-5.6/PZ 16-50 OSS and 4.6-6.3/55-210. They are both in great shape. Also comes with 3 batteries charges and case. Condition is Used. The eyepiece blind is broken. Appears to function properly when tested briefly. It is your responsibility to research what you are buying, talk to your wife, etc. Shutter count is about 14K. I opened box just for testing. 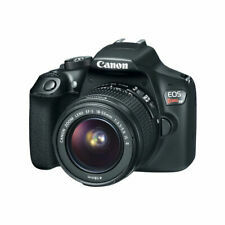 DSLR cameras help amateur and professional photographers alike achieve sharp, dynamic photos. DSLR stands for digital single lens reflex, which refers to the technology these cameras use to ensure a consistent level of photographic quality. When choosing the right device, there are many factors to consider, ranging from megapixels to exposure options. DSLR cameras all use the same basic photographic technology. The lens takes in light, which then bounces off a mirror, goes through a prism, and is transformed into a visible image at the viewfinder. To capture this image, photographers press the shutter button which tips the mirror and reroutes the light to the image sensor where the image is recorded. This system has a number of advantages. It results in an enhanced optical system, a wider array of lens options, and an improved autofocus system. Do DSLR cameras vary by skill level? Entry-Level: Entry-level cameras tend to be lightweight and portable with a pentamirror viewfinders. They are usually equipped with APS-C sensors, and they have about half a dozen exposure settings and auto modes. 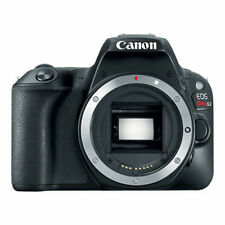 Intermediate: These cameras have enhanced video functions, improved exposure metering, and a continuous shooting rate. They offer more manual functions than beginner cameras, including manual control of speed and exposure. This allows intermediate photographers to have greater control over their final photographic products. Professional: These options are chock full of features, ranging from full manual control of exposure compensations to varied bracketing settings. These devices tend to have durable metal chassis, more storage capacity, and better audio and video capabilities. What effects do image sensors have on image quality? APS-C: These sensors can be used to achieve pristine images. They use a format similar to classic photo negatives with an aspect ratio of 3:2. Full Frame: These sensors are designed to capture more light than APS-C options which makes them optimal for photographers who often capture images in low light situations. Full frame options use a format that matches the traditional 35mm film frame area. Aperture: This measures the amount of light that passes through the lens. Adjustments are known as f-stops. Low f-stops allow more light to pass through while high f-stops minimize the passage of light. Most DSLRs have a wide range of f-stops, which allow photographers to maintain image quality in all lighting situations. ISO Sensitivity: This measures the extent to which the sensor is sensitive to light. One of the benefits of digital SLR cameras is that they can achieve sharp images even when set to high ISO numbers. Shutter Speed: Shutter speed refers to how long the shutter is open. Many DSLRs have extremely fast shutter speed options which allow photographers to capture crystal-clear action shots of sporting events and more. What are some popular makers of these digital cameras?